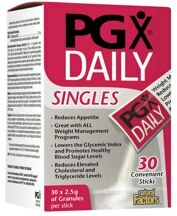 The PGX Daily Singles supplement is a stimulant free, safe method of reducing appetite and balancing levels of blood sugar for natural weight reduction. This fibre product was recommended by Dr Oz as “the most powerful source of fibre we know of”, and “a weight loss must have”. PGX is an original blend of plant fibre that can be easily added to meals. PGX soluble fibre products are convenient, and not based on caffeine or habit forming. Neither are they fad diets or nutrient blockers. PGX is an original blend of completely natural, water soluble, dietary fibre (polysaccharides) from plants. PGX contains a precise ratio of polysaccharides made from sodium alginate, xanthan gum and konjac root. Together, these components normalise blood and restore sensitivity to insulin more effectively than any other supplement, or diet plan, ever studied. PGX Daily Singles do not contain artificial preservatives, colours, sweeteners, gluten, corn, wheat, yeast or starch. Potency and purity are assured. Scientific tests have demonstrated PGX’s ability to slow down carbohydrate digestion, whilst boosting the sensation of satiety. PGX promotes healthy cholesterol and blood sugar, lowers food cravings and appetite. Some people put weight on because of erratic blood sugar. You consume something and your blood sugar shoots up, only to plummet later on. This can cause you to feel irritable and tired, and make you hungry. PGX fibre restores sensitivity to insulin so that fluctuations in blood sugar are lessened. PGX resets the metabolic rate and (almost) alters the glycemic index of the food you consume, so the body can change how it deals with insulin. Once you mix PGX Daily into water, it expands and your food grows in volume and viscosity. Consequently, carbohydrate absorption is slowed down, so sugar gets released into the blood stream less rapidly. You will feel full-up quicker, you will not become hungry again so fast. Also, you will encounter fewer cravings for food. Who Will PGX Daily Singles Help? Those wanting to lower appetite. Those with cravings for food (particularly sugar). Dieters who haven’t got the will power to keep to stringent diets. Those who wish to slim down, but who can’t enact big lifestyle alterations right now. People who struggle with maintaining stable energy levels. People who need to reduce their diet’s glycemic index to encourage healthy levels of blood sugar. People wishing to maintain their healthy levels of triglyceride and cholesterol. Diabetics who have to lower their L.D.L. cholesterol. Those desiring the advantages of soluble fibre, without needing to swallow foul tasting powders or tablets. The PGX Daily Singles supplement is user-friendly, even if you are eating out. Each package of PGX sticks has 2.5g of PGX granules in it. Simply rip the package open and sprinkle your food with it. It will not change how your food tastes. Alternatively, you might empty the PGX package into a glass of juice, water or milk-shake. Also, PGX Daily Singles can be sprinkled onto yoghurt, soups and desserts. 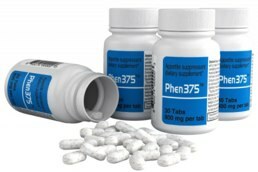 Without running the risk of repeating ourselves Phen375 is a highly recommended commercial diet pill. It suppresses appetite and burns fat and is arguably the most effective diet pill to purchase without prescription if public perception if anything to go buy. it is one of the biggest selling diet products the world over. PGX Daily Singles Review3.0000000000001admin22012-09-05 01:03:48The PGX Daily Singles supplement is a stimulant free, safe method of reducing appetite and balancing levels of blood sugar for natural weight reduction.